Vapor Fi is a premium e-cig brand offering a full range of vaping products, including a nice selection of U.S. made e-juice. They have over 50 flavors in their standard e-liquid line that consists of 70/30 PG/VG, but Vapor Fi Reserve is their premium collection of six unique 40/60 PG/VG blends. 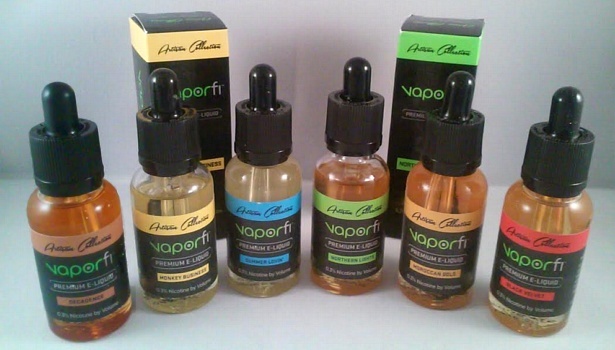 Pre-steeped and layered, here are our thoughts about Vapor Fi Reserve e-liquid. Vapor Fi isn’t your typical e-cigarette company; offering a wide variety of products for nearly every type of vaper. Whether you’re a beginner or a dedicated vaping enthusiast, Vapor Fi is attempting to to reach vapers at every end of the spectrum. A subsidiary of International Vapor Group, Inc., the company has a strong online presence, as well as a large network of brick-and-mortar retail stores; mostly in southern Florida. In regards to their e-juice, Vapor Fi has a wide selection of American-made products developed in a state of the art, FDA registered lab. Comprised of “USP Grade Kosher” and GRAS-rated ingredients, their standard e-liquid comes in over 50 flavors (70/30 or 50/50 PG/VG) and can even be custom blended with up to 3 flavor shots – an option you won’t find at most vendors. Although they certainly have a lot of choices, their standard e-juice is not pre-steeped, it comes in plastic bottles, and they’re limited in depth and complexity. That’s where the Reserve line comes in. In an attempt to compete on the premium or “craft” side of the e-juice market, Vapor Fi has introduced six new complex flavors known as the Vapor Fi Reserve Collection. Like their standard line of e-juice it’s 100% USA made with the highest quality USP Grade ingredients, but the Reserve line contains a higher level of VG (40/60 PG/VG), more finely tuned and layered flavor profiles, glass bottles with drippers and it’s fully pre-steeped (aged) so that it’s matured and ready to vape right out of the bottle. Black Velvet (3/5) – Probably our least favorite flavor of the bunch, not necessarily because it was bad or poorly done, but because cola flavors aren’t typically favorites for us. Add in some cherry, which doesn’t normally score well with us either, and our opinion is already biased to the negative side. Within the realm of cherry cola flavors, though, Black Velvet is certainly one of the better options we’ve tried (and there are lots of them!). Smooth, refreshing and subtly sweet, it accurately replicates the soft drink and is definitely worth a shot if cola flavors are your thing. Decadence (4.5/5) – Decadence is another flavor that started out with a bit of negative bias, since chocolate flavors can sometimes be too rich or overpowering for our liking. In this particular case, you get a mild hint of chocolate but it’s nicely complimented by cream and a hint of hazelnut. It definitely has more of a creamy feel, providing a smooth and velvety vape that we all thoroughly enjoyed. Soft and subtly sweet with just the right amount of authentic, chocolate flavoring, Decadence was a delicious all-day-vape that had us regularly coming back for more. Monkey Business (4/5) – Described as “creamy with a light taste of custard topped with sweet and powerful banana,” Monkey business was pleasant and smooth, similar to the filling in a banana cream pie. The banana was more pronounced and had an authentic flavor, while the custard was a little less noticeable. Overall we thought it was tasty… but not our favorite. Moroccan Gold (3.5/5) – Tobacco flavors aren’t necessarily our preference, but Moroccan Gold is certainly one of the better options we’ve tried in recent months. Complimented by vanilla and subtle hints of coconut, the tobacco is layered nicely with sweet, creamy undertones. It starts off like a tasty vanilla pipe tobacco and finishes off smooth with a bit of coconut. A pleasant surprise that was well-balanced and flavorful. Northern Lights (5/5) – Although none of us regularly vape menthol flavors, Northern Lights was undoubtedly our favorite option from the Vapor Fi Reserve Collection. It’s a perfectly balanced mix of fruit with just the right amount of subtle mint flavoring. The melony guava base is the obvious stand out, providing a sweet and authentic tropical feel that’s super tasty, and the menthol gives it a refreshing and enjoyable twist. Even if you’re not a fan of menthol flavors, you should definitely give it a try. A fruity menthol vape that isn’t too overpowering… and REALLY TASTY! Summer Lovin (4/5) – Described as “lemon and tangy raspberry,” Summer Lovin is the only pure fruit flavor from the Reserve line, and another example of something that doesn’t normally score well with us. We’ve reviewed other tart, lemonade flavors and they’re often too much for our taste buds. In this particular case, we didn’t feel like it was overpowering at all. An obvious lemon / raspberry base that was softened up with other fruits and possibly some coconut. Sort of like a lemonade pina colada; unique and flavorful. Considering this is their first attempt at a “premium” e-juice line, we think Vapor Fi did a nice job and they undoubtedly came up with a few winners. Northern Lights and Decadence were both flavors that we thoroughly enjoyed and would proudly recommend to our friends (and visitors). Flavorful, well-balanced and smooth, each offered a unique experience and ended up being immensely satisfying. Monkey Business was a decent banana custard flavor and Moroccan Gold and Summer Lovin were pretty good too, but we’re not sure why a cherry cola blend (Black Velvet) was thrown into the “premium” category. It wasn’t inaccurate, but it tasted like a typical cola flavor you could find almost anywhere. They might not have knocked them all out of the park, but all-in-all Vapor Fi’s Reserve E-Liquid is a huge step forward for the company and worth your consideration. ABOUT OUR REVIEWS: Since flavor preferences vary and depend on a variety of factors, we use several members of our team to complete our e-liquid reviews. This Vapor Fi Reserve e-juice review was conducted by: Jeremy Salter, Vanessa Salias and Christopher Arthur. Their feedback was gathered, combined and summarized on this page, but please keep in mind that this is the general opinion of our team and should be treated as such. Liquid performance varies depending on the device, and flavor preferences vary for each individual. We strongly suggest that you consider the feedback of others and experiment on your own. This is our Vapor Fi Reserve e-juice rating. How would you rate the Reserve line? What do you think about the company and their products? Please share!